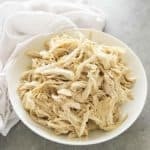 Instant Pot Shredded Chicken comes out perfectly juicy and tender every time! 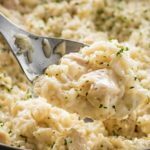 The easiest way to make a big batch of chicken for your favorite recipes! You guys have been asking for this one long enough! 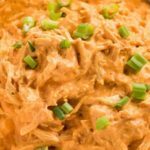 My Crockpot Shredded Chicken has been one of my most popular recipes, and one of the first that ever went on the blog. 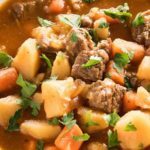 But, I’ve had so many of you reach out and ask for the same recipe, but how to make it work in your pressure cooker. Happy to report that I have been super pleased with the results after testing this a few times to make sure the cook time was just right. 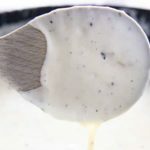 I’ve tried this out in a 6-quart and 8-quart Instant Pot from fresh, and from frozen, and I’m going to give you all the directions so you can make it work best for you! Chicken is so versatile! 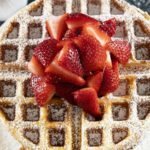 These are a few of my favorite dishes to use it in! 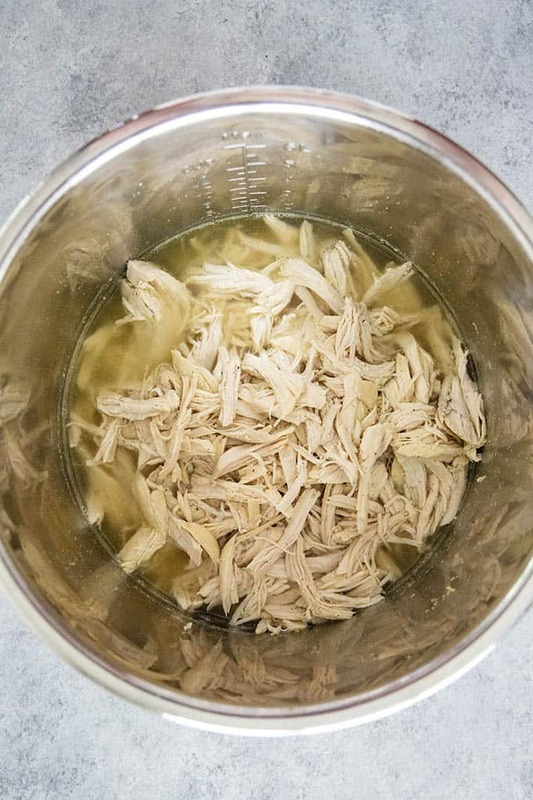 Add your chicken breasts, fresh or frozen to the bottom of your Instant Pot. Season the breasts as evenly as you can, then pour over the chicken broth. Cook on manual. 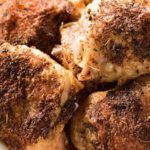 This recipe calls for 3 pounds of chicken, if cooking from fresh (raw) they will cook for 13 minutes. If cooking from frozen, up the time to 16 minutes. Keep in mind that it will take about 10 minutes for the pot to come to pressure, then, it will need to natural pressure release for 10 minutes before opening. 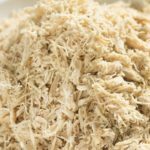 There are a few ways you can shred your chicken to your own preference, so I thought I’d give you a few options. Once you remove the lid from the pot, turn the instant pot off. As you can see in the photo below, I like to shred my chicken right in the Instant Pot. I do this because then I can kind of swirl the chicken around in the juices, and remove it to a bowl with a slotted spoon to cool. If you’d prefer, you can remove the breasts to a large bowl first. Then, use two forks or a hand mixer to shred the chicken really easily. If you’re making this ahead, shred the chicken, then allow it to cool. Place in a sealed container or large zip top bag. 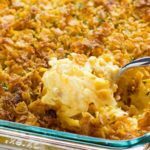 This will last in the refrigerator for about 5 days, or in the freezer for up to 3 months. 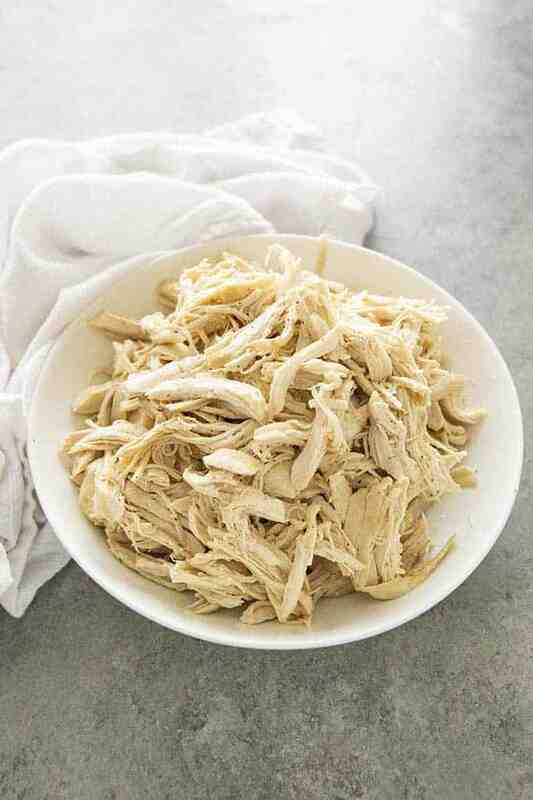 If you freeze the chicken, allow it to thaw in the refrigerator for several hours before using. 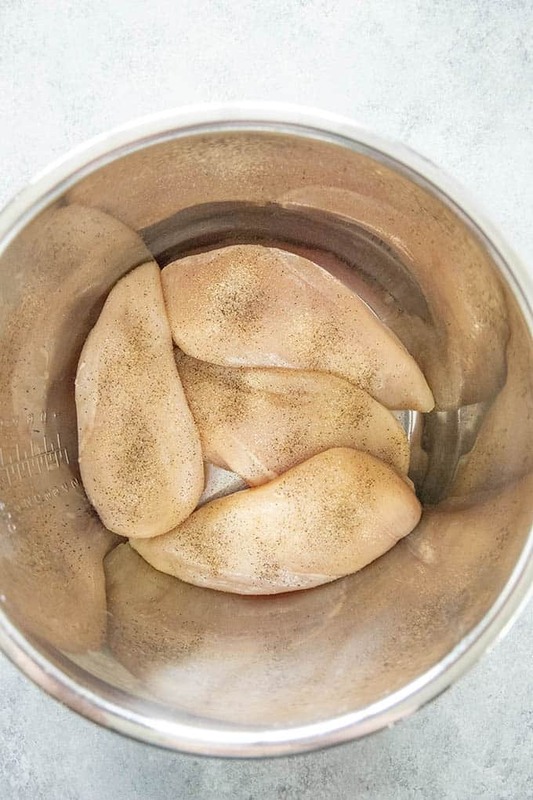 Place the chicken breasts into the bottom of the instant pot and sprinkle evenly with the seasonings. FOR FROZEN CHICKEN BREASTS: Cook on manual, high setting for 16 minutes. FOR FRESH (RAW) CHICKEN BREASTS: Cook on manual, high setting for 13 minutes. Once the cook time is up, allow the pot to natural pressure release for 10 minutes. Then, carefully open the valve to remove any excess steam. 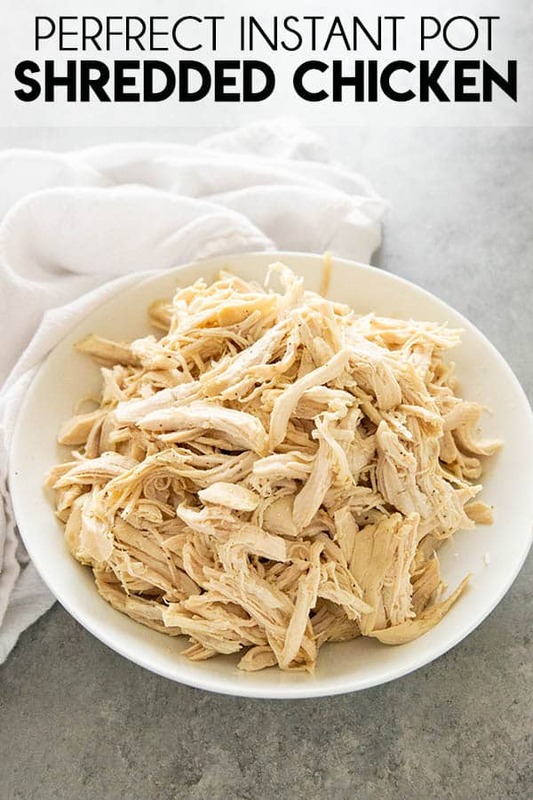 Turn the Instant Pot off and shred the chicken in the pot, or remove to a bowl and shred using two forks or a hand mixer. Use immediately, or once cool, refrigerate in an airtight bag or container for up to 5 days, or in the freezer for up to 3 months. NOTE: Allow 10 minutes for the pot to come to pressure, plus cook time, plus ten minutes for natural pressure release. NOTE: If freezing this chicken, allow it to thaw in the refrigerator overnight before using in your favorite recipes.